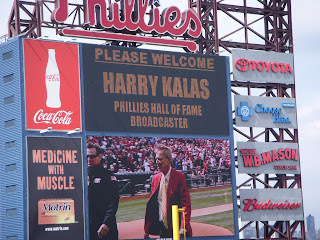 Beloved Phillies announcer, Harry Kalas, THE VOICE of the Phillies since 1971, died today, at the age of 73. He died, on the job, in Washington, DC, doing what he loved best, working for the Phillies, getting ready to cover the day's game, the Phillies vs the Washington Nationals. I had the privilege of attending many Phillies games and listening to Mr. Kalas's play by play for a better part of the past 22 years of my life. I've been an avid Phillies Phan since I was a young teenager, falling in love with the Phillies during the 1980 World Series. In the years that followed, my fascination and love of the game has grown with each passing year. 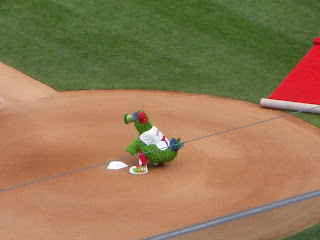 Harry has been an integral part of my Phillies experience. The game won't be the same without him. Summers in our backyard, listening to the Phillies game on the radio won't have the same special feeling now that his distinctive voice has been silenced. I am so happy that I've had years of listening thrills and chills, hearing Harry's calls, the infamous "This Ball Is OUTTA Here!" and the final play of the 2008 World Series call "The Phillies Win!" Last week was the Opening Week of the 2009 Baseball Season. 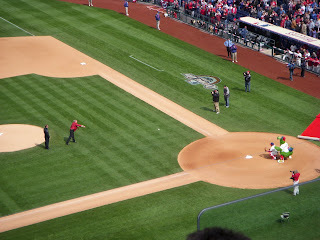 Two of the home games played at Citizens' Bank Ballpark were the Opening Day and Ring Ceremony Games, both of which we were able to attend. 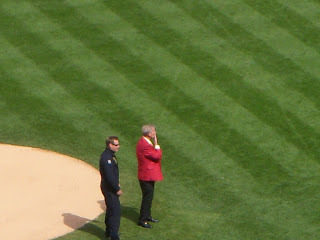 During the Ring Ceremony Festivities, Harry Kalas threw out the ceremonial first pitch to The Phanatic. Right before my camera battery gave out, I snapped these photos. So glad that I did. 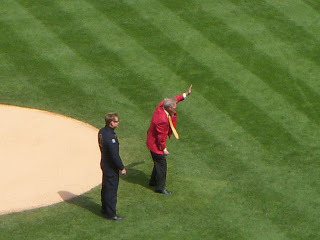 Mr. Kalas, thanks for the memories. Here's the wind-up and the throw, right down the line! Blowing us a kiss, thanks for the fun, good times and great calls. I'm very sad about this. The games just won't be the same without him. For as long as I can remember (30+years! ), I can remember Harry being part of the Phillies games, and his voice reminds me of summers growing up - such good memories. He will be missed! I know, that's just how I feel. I've been listening to the games since I was a teen, and there's always been Harry and back in the day, Whitey, calling the games. I can honestly say I've been a fan since I was 13, nearly 30 years now for me too! It all started with the 1980's team, though I do remember when Charlie Hustle came to town in the late 1970's!